When a criminal from the year 3000, named Ransik, escapes and travels into the past, four soldiers from the future must team up with a wealthy youngster from 2001 to prevent Ransik and his minions from spreading terror and destruction throughout time. The Rangers set up shop at an abandoned clock tower owned by Mr. Collins, where they run an odd job shop. They store captured mutants in a cryo chamber, and keep an eye on the city with a holographic viewer. 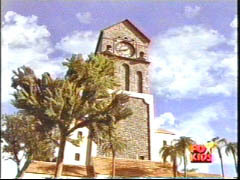 The clock tower was destroyed in a battle between Eric and Wes and an army of Cyclobots.